The brand new four-episode collection from Dora and Friends is now available on DVD from 14th September 2015 in good retailers including Amazon. 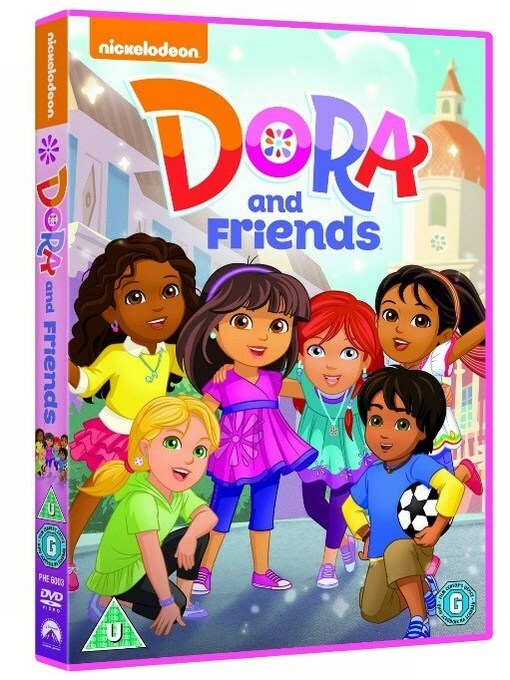 This DVD contains 88 minutes of little Latina heroine Dora as she travels the world with her trusty pals, educating an adoring public by teaching them new languages as she goes. Dora’s moved to a beautiful pan-Latino metropolis by the sea called Playa Verde, entered a diverse new school, and is busier than ever. She’s also found a new group of friends with a shared passion for learning and exploring who join her on new adventures in the city. Together, all for one! Dora and her new group of friends are ready to go on exciting adventures in a new city. But this is no ordinary town. Around every corner, there are portals to magical worlds filled with surprises, obstacles and villains waiting to test Dora and her friends with challenges. Luckily, Dora has new tools to aid her and her friends -like a smart phone featuring Map app and other magical gadgets galore. Join Dora, Naiya, Emma, Kate, Alana, and Pablo for 4 magical adventures in this very special release. The episodes are: We Save a Pirate Ship, The Royal Ball, The Magic Ring and Dance Party. DORA AND FRIENDS asks you to help Dora and her friends travel to an ancient world to return a lost ring, discover a talking ship in a secret pirate cave, embark on a royal adventure to return a dress to a princess, and bring dance back to a town where it’s been outlawed! ¡Qué mágico! Now Zero Degrees West is giving this Dora and Friends DVD to one of my followers! So good luck and enter through Gleam! Also, remember to check out the rest of my giveaways! This giveaway is open to all UK residents only. ONE winner will be chosen via Gleam and announced on this page. The winner will be contacted by e-mail within 3 days of competition ends, if they do not respond within 28 days another winner may be chosen. Your details will be passed to Zero Degrees West, but will not be passed onto any third parties by ET Speaks From Home. The prize will be sent directly to the winner from Zero Degrees West. Delivery is not in the hands of ET Speaks From Home’s Blog and may take some time to arrive. Any damage to the prize is not ET Speaks From Home’s responsibility. The company reserves the right to substitute the prize for one of a similar type/value if the prize above is not available. Competition starts on 25/09/2015 12 am – 26/10/2015 11.59pm. Disclosure: Contains Amazon affiliate link. Welcome to ET Speaks From Home. My name is Eileen, mother of two children aged 11 and 9. We have been online since 2012 and continue to grow. I love to cook, craft, DIY, write about Chinese Culture and YouTube reviews. ©2012-2019 Eileen Teo unless otherwise stated. All rights reserved. You may not reproduce text excerpts or images without my prior permission.